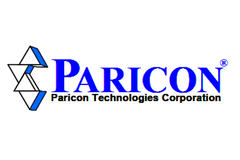 Paricon Technologies - RFMW UK, Ltd.
Paricon is based in E. Coast USA and was founded in 1997 by Roger Weiss who is ex-Bell Labs and aquired the technology from them. The Paricon solution is based on a silicone elastomer which has conductive elements captured within it – giving Z-axis conductivity whilst retaining excellent X and Y axis isolation. The material is available in different sizes based on the size of contacts you are contacting to. The smallest pitch contacts are 0.1mm which means that connecting to the largest memory chips is done with ease and high repeatability. The solution is used for mounting and testing FPGA / memory chips as well as for connecting flex to rigid pcb’s. It is also being used for microwave / millimetre wave testing. In all applications the joint can be ‘broken’ and remade. The PariPoser® contact system is the only particle based conductive film that is qualified and proven for long term use in communication, computer, instrumentation and other demanding applications. The Flex–to-Board (F2B™) interconnect system is based on the proven PariPoser conductive film coupled with a unique spring clamp design** that assures a uniform, compressive load is applied to each contact. The design allows ease of assembly and disassembly requiring no soldering or adhesives. Alignment and retention are provided by a pair of small posts that are outside of the I/O area. Several different attachment methods are available to facilitate the use of this exceptionally low cost solution. In Space applications – solderless Space Application sockets are designed to provide exceptional performance under harsh environments. These devices have the best RF performance of any known socket, with less than 0.3 db insertion loss at 40 GHz. as well as the smallest footprint of any socket in the industry. Click on the image for data for some examples of interconnect applications for the elastomer solutions for repeatable low RF loss.